June Lake Marina (760)648-7726 (closing Oct. 28th) and Big Rock Resort (760)658-7717 (closing Oct. 31st). The Marina released another batch of their Oregon Rainbows last week. Along with that and the continuing good Cutthroat season June is best fished trolling lead core down to 8 colors. After the marinas close ya gotta get on the water with tubes or kayaks as mentioned or from shore using that two rod method while moving along. 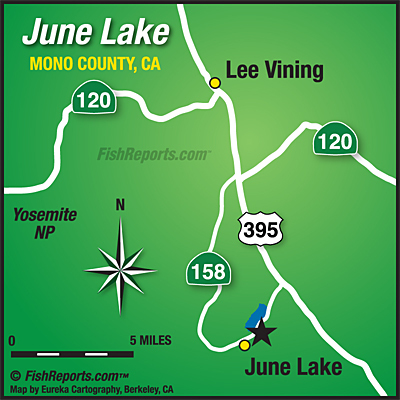 June Lake area report provided by Ernie's Tackle and Ski Shop, they can be reached at 760-648-7756. Gull Lake: Marina and Boat Ramp Due to Close Oct. 31st.